Smart Home Technology gives you the ability to control your home no matter where you are via a computer or smart mobile device. With this advanced system, you no longer have to worry if you forgot to turn on a light or appliance, as it allows you to power them remotely. You can even set your thermostat and lock your doors while away. Take tracking your packages to a whole new level! With our Video doorbell, you can also monitor visitors who arrive at your home and record their activity. Together, our Smart Home devices provide you with the security, convenience, and energy management you need. The Hub is a standalone home automation hub. 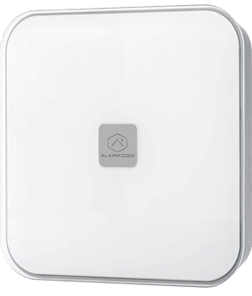 It enables communication between home automation end-point devices and the Alarm.com cloud service via a cellular or Ethernet network. A user is able to remotely control functions on the Hub and its associated Alarm.com Interactive Services (including Zwave devices) via a web application or mobile app. a 3-year contract agreement, billed by Home Telecom. *All packages including Security Monitoring will require a 3-year contract agreement, billed by Home Telecom. Call or Email our Residential Sales Team to Learn More! *Purchase of additional equipment may be necessary. Some Home Telecom offerings are not compatible with all security systems. Managed Whole-Home WiFi requires Home Telecom internet package. All Security packages require a 3 year monitoring agreement. Early termination fee of $250 applies. App-based control for Home Automation provided by Alarm.com. 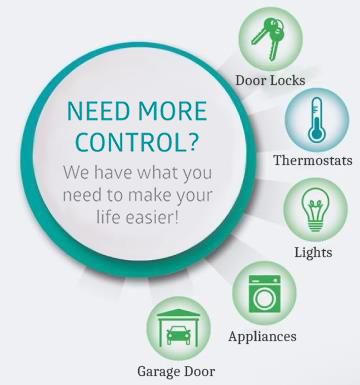 App-based control for Security and Home Automation provided by Total Connect or Alarm.com dependent upon equipment chosen. Additional restrictions may apply. The Hub that will control Zwave devices from an app. Locks, Doorbells, Thermostats, Garage Door Openers and Lighting can be controlled. NOTE: If you add Security to your services, you will need to replace The Hub with a currently available security panel. IQ Panel 2 is a 7” HD touchscreen with built-in 5MP camera and multiple wireless radios in a clean, elegant, modern user interface. The IQ Panel 2 keeps you connected to an entire ecosystem of smart devices giving you control over your entire home. Exciting new features like touchless disarming using Bluetooth and a built-in glass break detector are enabled through powerful software that improves over time through regular software updates. Takes a picture of anyone that disarms the system. When the alarm is triggered, a picture is sent to the authorized user on the account.